The Resource Center (RC) contains valuable resource materials for undergraduate students, graduate students, and faculty. The best way to receive quick assistance from a Resource Center graduate assistant is to visit AH-0348 during regular business hours. For questions that are not urgent, you can use siuerc@hotmail.com. The RC is open approximately 40 hours per week during the Fall and Spring semesters and closed throughout the summer months. Check for hours of operation posted on the Resource Center door or email the office for this semester's hours. One of the primary functions of the RC is to maintain the Department's Psychological Test Inventory. 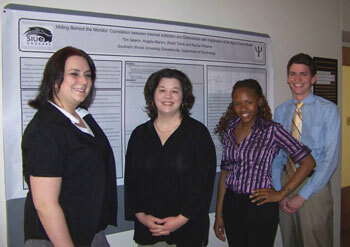 The RC graduate assistants can assist students and faculty in locating tests for research, clinical, or academic applications. The test inventory is used by graduate students who are learning to administer and interpret psychological tests in the context of one of the Department's various graduate assessment courses. Graduate students enrolled in clinical practica experiences or serving as Head Start graduate assistants also use the tests in their roles as clinicians in training. Undergraduates may use some of the tests while completing coursework or supervised research. However, there are Department of Psychology Guidelines limiting the use of our psychological tests to individuals trained in their administration and interpretation. The tests are also used for research projects conducted by students and faculty in the Department. A student wishing to examine or check a test out of the RC must be working with a departmental faculty member who is responsible to supervise the test use by the student. The faculty member must sign an Authorization Form which authorizes the student to examine or check out the test(s) authorized by the student's faculty supervisor. The Resource Center has several books containing hundreds of published research questionnaires (which you can search through in this file). To easily locate measures within any of the books listed above, open this text file, which contains the full list of all measures contained within the above books. To quickly search through the file using keywords, use Ctrl-F (i.e., Edit > Find). Browsing the list of available measures may help generate or refine your research ideas. If you are having trouble finding a measure that fits your needs, you may want to visit the International Personality Item Pool or the Social-personality Psychology Questionnaire Instrument Compendium to search the hundreds of instruments that can be downloaded there. A careful search in a popular search engine such as Google may also help, because many well-established questionnaires are available online. You will be most successful finding a measure you are looking for through a search engine if you already have an example item from the test (perhaps obtained from a research article you read). For example, if you type "When good things happen to me, it affects me strongly" (with quotes) into Google, you will quickly find the full text of the BIS/BAS scales. If you don't have an example item, at least try searching on the name of the measure (e.g., "BIS/BAS Scales"). Of course, you should always carefully inspect any instrument that you find online to make sure it is accurate.